Still wreaking havoc and wowing sold out crowds across the country—while racking up citations and bans in numerous conservative cities—and recently surpassing a million albums sold and some 1,500 performances after a decade of joyous and rebellious musical troublemaking, The Kottonmouth Kings will soon be rolling in to a concert venue near you. It’s just another day at the hard driving, politically incendiary office for a band that’s racked up 675,000 miles over the years. This Fall, KMK celebrate the recent release and great indie success of their self-titled seventh album on Suburban Noize Records with a 40 date Supporting Radical Habits Tour , beginning at the Galaxy Concert Theatre in Santa Ana, California on October 13. The album, nicknamed KMK7, has sold over 56,000 units in two months and is currently #2 on the Billboard Independent Chart and #50 on Billboard’s Top 200. Their previous release, 2004′s Fire It Up , debuted at #42 on Billboard’s Top 200 and #4 on the indie chart. The ultra popular and frighteningly influential poster boys for counterculture America, Kottonmouth Kings are vintage anti-establishment all the way, with a one of a kind musical hybrid style that vocalist, emcee and founder Brad “Daddy” X dubs “rip hop” in deference to its fiery mix of the most aggressive elements of classic punk and hip-hop. KMK have been at the forefront of a traditionally underground, becoming increasingly overground swirl of joyful noise and intense controversy, but at the end of the day, they bring together thousands of wildly enthusiastic, freethinking fans from all walks of American culture. At a supercharged KMK concert, it’s not uncommon to find gray bearded hippies not quite over the loss of Jerry Garcia rumbling and dancing next to wild-haired punks, skater boyz, surfers and baggy pants hip hop kids—together forming a family atmosphere not seen since the days of the classic punk movement and the Deadheads. “It’s a beautiful mix of people,” says Brad X.
X says that despite the band’s troublemaking reputation, their music presents a deeper perspective on finding joy and peace via the laws of nature rather than the hypocritical laws of the government. “The theme of the band is personal freedom,” he adds, “and we believe firmly in free speech and the idea of following nature’s laws, not those of a government that we disagree with. The guys in the band reject the notion of oppressing life in any way, and our fans latch onto that because they think the same way. The first single from Kottonmouth Kings is “Peace of Mind,” a reggae flavored tune which addresses ways to maximize life via simple things in an increasingly insane world. KMK also recently shot a video for “Put It Down,” their historical, highly anticipated first full duet with Cypress Hill , with whom they’ve toured several times. The Kottonmouth Kings themselves are as diverse as their fan base. Drummer Lou Dog, inventor of the revolutionary, Monster Garage-inspired Drum Trike, was one of LA’s largest club promoters before jumping behind the kit, while co-front man D Loc threw away his college basketball scholarship in order to join the band; DJ Bobby B does the scratches that drive the madness. Then there’s Pakelika, dubbed the “visual assassin,” who invented a new art form called hydro mechanics—a combination of trippy street dancing, miming and popping. MC Johnny Richter was in and out of institutions for his delinquent activities, while Brad “Daddy” X has been playing punk rock and hip hop for more than 20 years now. In the mid-90′s, X was the voice of California punk rock legends the Humble Gods – who released an album on Hollywood Records and were protested by Christian Conservatives. During that time, X himself shared the stage with everyone from the Ramones, Green Day, Pennywise, Bad Brains, the Offspring and NOFX. On the opposite side, his hip-hop rap sheet is just as impressive; from signing a record deal with Eazy E’s Ruthless Records to opening for everyone from Eminem and Cypress Hill to Snoop Dogg and Busta Rhymes. The Kings themselves have shared stages with everyone from the Red Hot Chili Peppers and Marilyn Manson to No Doubt, Korn and Kid Rock. 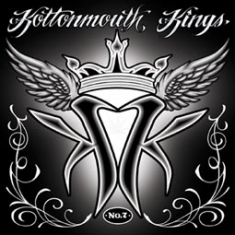 The Kottonmouth Kings musical diversity allows them to perform with everyone from hard rock giants to the biggest pop stars. They celebrated their love for the open road with a 2002 DVD entitled Endless Highway , a tour documentary which follows them across country. The 2004 KMK documentary DVD 10 Years Deep , gives insight into the fanatical fan base of the Kottonmouth Kings and their ten year run. In conjunction with their Fall 2005 tour, KMK is releasing a CD/DVD package called Joint Venture, which features six new KMK songs, two Daddy X solo tracks, two new tracks from MC’s Kingspade and six remixes of classic KMK tunes. Suburban Noize Records is also releasing a compilation called SRH (Supporting Radical Habits, same name as the tour and national lifestyle clothing line), which is a sampler of acts on the label as well as other artists like Pepper, Slightly Stoopid and Sen Dog from Cypress Hill. This collection is a follow up to the popular sampler disc Spaded, Jaded and Faded from a few years ago.